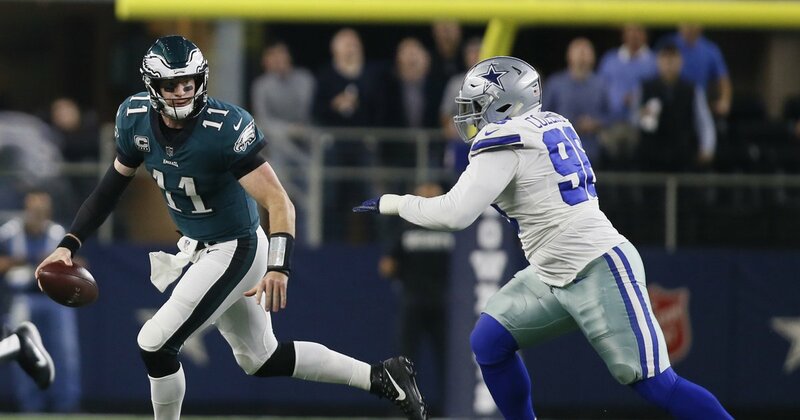 On Sunday night, the Eagles will play just their second divisional game of the season when they host Dak Prescott, Ezekiel Elliott and the Dallas Cowboys at Lincoln Financial Field and kick off the second half of their 2018 slate. We’ve broken down the injuries, pointed out the key matchups to watch and offered our own predictions for this one. Now, as we do every weekend, it’s time to take a look around the nation to see how the various experts, both local and national, think Sunday’s matchup is going to play out. The Eagles are coming off their bye, and they are beginning to get healthy again after dealing with one significant roster loss after the next for the entirety of the season so far. They also made an addition at the trade deadline in Golden Tate, who could help spark the offense. Meanwhile, the Cowboys head into Week 10 with bruised pride after a bad Monday night loss at home on national television to the Tennessee Titans. They’ll have a short week of preparation in a survival game to go along with a road trip to Philly. Momentum clearly favors the Eagles, who also just happen to have a much better quarterback, team, coaching staff, and ownership, if you think those things are important. • ESPN staff: All 10 of their national experts are picking the Eagles to beat the Cowboys. • CBSSports.com staff: All eight experts are predicting an Eagles’ win over the Cowboys on Sunday night, including Pete Prisco, who sees a two-score victory for the Birds. • OddsShark: Whoa. Their computer model suggests the Eagles win by 20 points on Sunday night. The NFC East remains a three-team race, but the Cowboys probably have to win this one to have a realistic chance of staying in that race. I like the Eagles to put a dagger in the Cowboys. When the Philadelphia Eagles smoked the Dallas Cowboys 37-9 last November in Texas, a Super Bowl team was gaining momentum against an opponent that was reeling without suspended running back Ezekiel Elliott. Philly is much less hot now, and the Cowboys have Elliott. Also worth consideration? The Eagles are coming off a bye, which was preceded by a solid British victory over the Jaguars, and quarterback Carson Wentz has posted four consecutive triple-digit passer ratings. He should continue to excel as his knee progresses. Meanwhile, Dallas is on short rest coming off a deflating Monday night loss to an unimpressive Titans team. Add it all up, and it looks safe to lay the touchdown with Philly. • SBNation staff: Each of their seven experts is taking the Eagles over the Cowboys on Sunday night. • Philly.com staff: I’m somehow still over my article limit for the month, but you can get their Eagles-Cowboys predictions right here. • Bleeding Green Nation staff: All seven of their writers are picking the Birds over Dallas. • NJ.com staff: All six of their football writers are picking the Birds, several of them by double digits, including Eagles beat writer Zack Rosenblatt. The Eagles are well-rested and just added another offensive weapon in Golden Tate to an offense that’s finally finding its groove. The Cowboys were beaten badly on Monday night by the Tennessee Titans and now have a quick turnaround — on the road — to get things back on track. Simply, Dallas is not very good, even with Amari Cooper in the fold. NFC East games are never easy, though this one could be for the Eagles. • Philly Influencer staff: All six of their writers are picking the Birds, including PhillyVoice contributor Nick Piccone, who incorrectly picked the a Jaguars win last week in London after swearing off picking the Eagles the rest of the way. I can’t go against my tweet, can I? Nah, maybe I can. Maybe the Cowboys are just that bad that it’d be stupid to pick against them just because of a tweet I made after the Eagles’ collapse against the Panthers. Although, this year’s team has left a lot to be desired in terms of holding leads and finishing games. In the second half of the season, they absolutely must take on a killer instinct, much like they had last season. It all starts Sunday night where they should beat Dallas by double-digits, but I won’t believe they have a killer instinct to bury teams until I see it. They’ll pull it off with a one-score win. Early Monday night, the Cowboys were in position against the Titans to take over the game, get back to .500, dive back into the division race and make this an even more dramatic duel with the Eagles. They failed on all counts, though, and now it’s the Eagles, with Golden Tate on hand to help, in position to launch a second-half run and chase down ailing Washington. Assume nothing about these Eagles, but they’re trending in the opposite direction from the Cowboys.